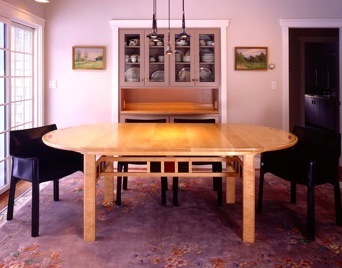 I built this dining table for a family that wanted a more stylized, contemporary piece, yet one which relied on traditional joinery and construction. The primary wood was curly maple, with accents of macassar ebony and pernambuco. I also inlayed lapis in the top to add another element to an otherwise fairly traditional form. The table has the capacity to be expanded to add two additional leaves providing for additional seating of 4 people. In closed position, 88 inches long, 44 inches wide, 30 inches high; with two additional leaves, 112 inches long.